Ella walks in on Reed and instead of denying it he just stands there in shock. Doing what she does best Ella takes off running but because they are Royals she doesn't get far. Reed screwed up dragged into a dark secret that he's kept from Ella. Now the girl he loves doesn't want anything to do with him that she ran but his father brought her back. Now they may be under the same roof but it's clear she wants nothing to do with him. He's not willing to give up, he's determined to be the man she needs and win her over. Ella's knows that Reed isn't good for her, after learning that he's been keeping a secret about his past but it doesn't change the fact that she's in love with him. Can Ella deny her heart, stay away from Reed and finish off her schooling so she can get away from the Royal family once and for all. As if she doesn't have enough issues she's still the target of several students at school and her guardian is getting married to his girlfriend. I love Ella and Reed they have issues but it's not been an easy childhood for either of them but together they just work. They aren't perfect they were broken before they met each other and now even while having issues they are amazing to each other. I love the chemistry between these two they are sweet yet steamy at the same time. They are quickly becoming one of my favorite couples and I can't wait to see them get a happy ever after. 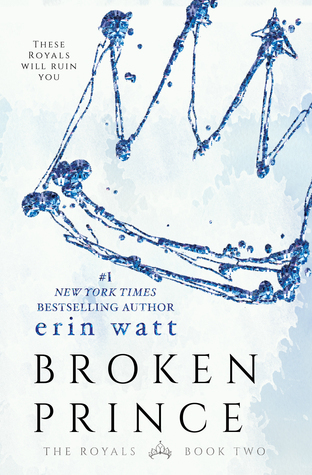 I dove right into Broken Prince right after finishing Paper Princess because I had to know what was going to happen next as it ended with a cliffhanger. Broken Prince was hard to put down like the first book I ended up finishing it in just an afternoon because it's just so good. I love Ella and Reed they are quickly becoming one of my favorite couples and I can't wait to see them get a happy ever after. The author has done an amazing job creating a captivating whirlwind story that keeps me on the edge of my seat. I love the authors writing style she's a wonderful storyteller with characters that are easy to connect with and a beautiful story. I can't wait to see how it's all going to play out.